MHT is a web archive format that was developed for storing web pages compactly. If you need to develop a software that would produce JPEG copies of MHT files, you may use special SDK. This will make the development process much easier and faster. For this purpose you can use MHT to JPEG SDK tool called Total HTML ConverterX. This is a server-oriented version of desktop Total HTML Converter. If you would like to integrate the conversion features into an application, you can do this with the help of ActiveX. Minimal adjustments are required in this case. You can just activate those conversion modes that you need. The program supports lots of conversion modes, offering export from MHT to PDF, Doc, JPEG, TIFF, TXT, etc. It is very easy to use Total HTML ConverterX for developing a custom MHT to JPEG C# converter as well. You can use the available code samples for help. It is suitable for other programming languages too (ASP, PHP). It is possible to use Total HTML ConverterX as a ready-made application for your corporate needs. It requires minimal setup on a server. For converting MHT to JPEG no GUI is provided, all conversion requests are sent to server via command line. It is possible to setup the converter for automatic mode. For this you need Total Folder Monitor. Using this additional tool all conversions will be run automatically on regular basis. Otherwise each time user needs to specify convert MHT to JPEG command line parameters manually. 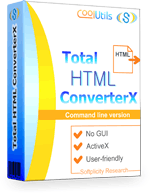 Total HTML ConverterX is available in free trial, so you can try it before purchasing. Take a look at code samples to understand how it is integrated into the code.